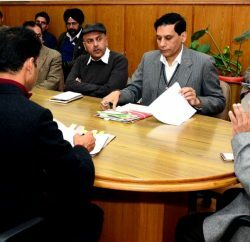 In the Himachal Sanskrit Academy Meeting, Chief Minister Prem Kumar Dhumal declared that Himachal Sanskrit Academy would be conducting crash courses to train temple priests (Pujaris) performing devotional services in the prominent temples in the State in different activities they were required to perform. 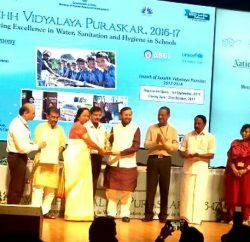 Chief Minister said that the Academy had been rendering yeoman service in conservation and preservation of Sanskrit language. He said that Sanskrit had the pride of being oldest language in the world which had its own grammar and script. He said that the devotional services being carried in temples for the devotees had to be in accordance with the laid down procedure under ‘Hinduism’. He said that correct pronunciation of the words carry immense impact on the devotional service being performed. He said that the Academy would be launching ‘Punascharya’ programme to train the ‘Pujaris’ in carrying their duties in a proper devotional manner. He said that it would go a long way in upgrading their professional skills as learned ‘Pundits’ would be imparting training. Prof. Dhumal laid stress upon propagation of the Sanskrit language at all level, especially in educational institutions so that the legacy of Hinduism was carried forward by future generations as well. He said that the Academy needed to organize different activities propagating the importance of Sanskrit so that youth were attracted to learn Sanskrit language. He advised the Academy authorities to draw calendar relating to its activities based upon the Hindu calendar so that all activities were organized in accordance with the festivals and days mentioned in the Hindu scripts. P.C.Dhiman, Principal Secretary Education, apprised the Chief Minister of the achievements and future programmes of the academy. Dr. Ganesh Datt Bhardwaj, Secretary of the Academy welcomed the Chief Minister, and conducted proceedings of the Meeting. He detailed the itinerary of the calendar drawn for the current financial year. 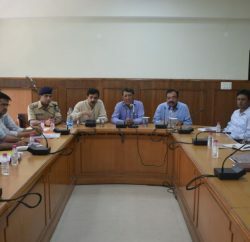 Besides I.D.Dhiman, Education Minister, non-official members of the Academy, Rakesh Kanwar, Director, Language and Culture, Dr. Dinkar Burathoki, Director of Education and other officers were present in the meeting.